Preheat oven to 400°F. Unfold the puff pastry on a floured cutting board. Brush the side facing up with butter. Sprinkle liberally with sugar and cinnamon. Working from one end, roll the puff pastry towards the center, stopping at the center point. Repeat with the opposing side of the puff pastry. Using a very sharp knife, cut the rolled up puff pastry into 1/4-inch slices and place on a parchment lined baking sheet, leaving about 1/2-inch between them. Brush with egg white and sprinkle with additional sugar, if desired. Bake for 15-20 minutes, until golden and cooked through. Elephant Ears are cookies. Sometimes big ones, but I make little ones, perfect for little hands … or the side of a teacup. 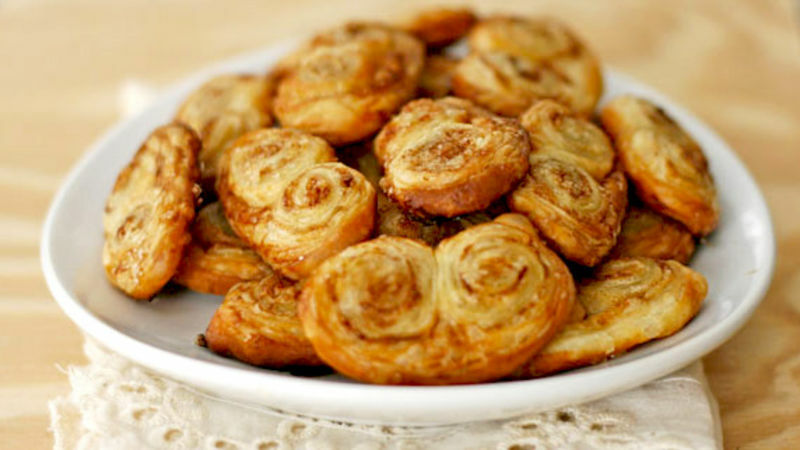 Whatever you call them, these delicate, crunchy cookies are a wonderful, but not too sweet, treat for whenever. And since they are a cinch to make -- about 30 minutes from start to finish -- you can whip ‘em up whenever the desire strikes you. This recipe for Elephant Ears fills them with turbinado sugar and cinnamon -- a delicious combination. Now, I love them plain, but they are also really, really good dipped in chocolate. Simply melt a little good-quality dark or milk chocolate and dip one end of the cookies in. Then, let them cool/dry on waxed paper for about an hour before enjoying. And if you want to make them even more special, try sprinkling the cookies with chopped walnuts right after dipping them. Do all cookies need to be super sweet? Or do you like them only lightly sweetened sometimes too?